While you’re there, check out some of the most popular wines like Peckerhead Red, Dodging Tornadoes and Black Out. With shipping to 37 states (including Alaska and Hawaii), send your pick to family and friends to give them a taste of Wichita. Enjoy a small five-course meal where each course is paired with your choice of a sweet or dry wine. Become an honorary winemaker and mix up a custom blend with three reds or three whites. Send a picture ahead of time and have it printed on the label. Build Your Own Wine Day creates the perfect gift with a personal touch for the wine lover in your family. Get two hours of exclusive access to the executive tasting room and a private tour of the vineyard. Choose your favorite wine to sip while you learn about the wine process and Grace Hill’s history. Learn the difference between properly-aged wines, wines still in the process of aging and newly barreled wines during this one-of-a-kind experience at the vineyard. Grace Hill Winery is the perfect place to familiarize yourself with the local pour ahead of Midwest Winefest, coming to Wichita April 26-28. This annual event typically sells out and goes to benefit Guadalupe Health Foundation. Tickets for each night go on sale March 12. This event begins at the original Farm & Art Market plaza and wraps around Wichita’s brick street district. Try two wines at each stop. VIP tickets are available for $95. VIP ticket holders will get a souvenir Riedel wine glass to sip their wine and Greystone Steakhouse & Seafood appetizers. Learn more about how to purchase tickets here. Every year, a winery is showcased during the Celebrity Wine Dinners. This year, there are two opportunities to enjoy wine, food and great company. Head to YaYa’s Eurobistro to sample Justin Winery or Siena Tuscan Steakhouse for Pahlmeyer Winery on April 27 for a delicious five-course meal and wine pairing. All proceeds benefit Guadalupe Health Foundation, which supports Guadalupe Clinic. 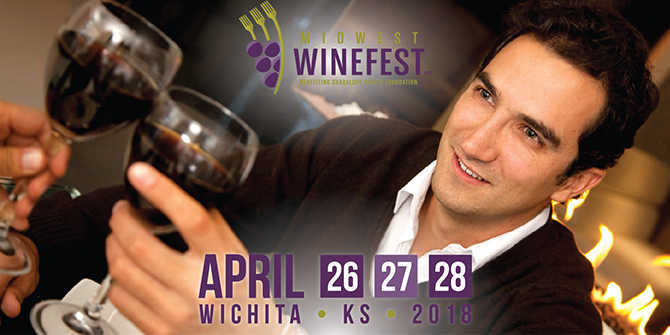 The final day of Midwest Winefest brings the Grand Tasting, one of the most popular events of the festival. Wine lovers can sample more than 300 wines, food from more than 40 chefs and explore a plethora of vendors. Each area represents a wine, country or region. Find your favorite flavor ahead of National Wine Day (May 25). The Reserve Room Experience provides patrons with Advocate/Spectator 94+ point-rated wines from the Pacific Northwest, Europe, South America and Australia.